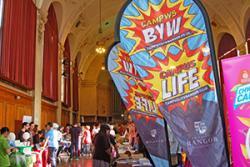 Last week's busy and colourful Serendipity event.Following a busy week of ‘Welcome’ and ‘orientation’ activities, over 2000 new students at Bangor University are this week settling in to academic life. They will no doubt be pleased that they’ve chosen to study at the university which is the best in Wales and seventh in the UK for student satisfaction according to the National Student Survey. “We have a great ‘offer’ to the students studying at Bangor. We have a 130 year tradition of providing excellent teaching and student care, and we take great pride in the quality of both our teaching and our research. We've recently introduced initiatives to give students a stronger voice in the University, and the success of our approach is reflected in recent surveys." Students have opted for degree combinations from a wide range across arts & humanities, business, law, social sciences, education and healthcare sciences and the traditional sciences. Subjects in environmental sciences, geography, biology and marine sciences are increasingly popular among the University’s new students, while places on courses such as psychology continue to be sought after. New students have an opportunity to find out what Clubs and Socieites are available to join at Serendipity.One of the Welcome Week highlights was the vibrant two day ‘Serendipity’ event. This provides new students with an opportunity to learn about the range of student societies and sport clubs available to them, as well providing information about a host of local businesses, organisations and charities. Bangor’s students are the only ones at any public university in the UK who can join Students’ Union’s Clubs and Societies for free. 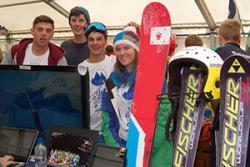 The Clubs and Societies reflect a broad range of interests as well as supporting the academic subjects being studied. With over 50 sports teams and clubs within the Athletic Union, Bangor’s students have plenty of opportunities to get involved with sports while studying, especially following the £2.5m investment in the sports facilities at the University’s Canolfan Brailsford and the completion of Bangor City's new 3G pitch which was developed with the financial support of University. Students can also get involved in volunteering through the Students’ Union. As well as orientation and social activities, such as walking tours of the city or visits to the beach and other social activities, students have been selecting the modules they want to study and learning more about what studying at Bangor has to offer them. With study abroad options, free opportunities to learn Welsh and a number of other languages, as well as the Bangor Employability Award among additional activities that students can get involved in, Bangor’s students have plenty of opportunities to enhance their experience and their CV while studying. While the ‘freshers’ get used to student life at Bangor, attention is also turning to current further education and sixth form students and anyone considering university degrees. The University’s next Open Days are on Saturday the 11th and 25th October. Registration to attend these events is now open through the University’s website.